Wow what an awesome give away. I'm a new follower and member of TCC. WOW! Amazing!! I am a new follower, and new member at TCC! I also posted it on my blog! (and Tiffany from Breakfast @ Tiffany's sent me)! thanks for the chance to win!! Amazing candy! Thanks for the new group and a chance to win. I went and posted it on my blog and made a link. YUM! Count me in. This looks just great. Hey there!! nice candy offering!! I'm a follower here, the stamping boutique and I'm a member of TCC. I posted a post on my blog AND put your candy and link on my sidebar (since new blog posts will bump the post about your candy down). Thanks for a chance to win some awesome stuff!! Very nice candy. New follower and member. And I really like what I see. Awesome giveaway I would love it to win those markers!!!! I need to add to my new collection!!! became a member of tcc.. can't wait to get in there. signed up for e-mail BUT the word FOLLOWER is just there and no way for me to become a follower! let me know and I will be back. Michelle from peanut butter & Jelly sent me to this awesome new blog! Found TCC - I'm a new follower and member of TCC, popped in my candy jar on my blog also. Hi Tracey ! Thank you for the chance to win your awesome candy. I saw this giveaway at the Stamping boutique and I'm a follower now of TCC blog too. This is great fun! Thanks for the invite to join. I know I am gonna love it here! Thanks also for the great chance to win!! awesome blog candy.. I am a new follower. I am off to join TCC. Thanks for the fun giveaway..
WAw this is fab candy, thanks for the chance. I am already your follower and posted about the candy on my sidebar. Wow! New member here! Thanks for the chance to win! Love the site, and the candy!!! copics! I've been dying to get some and try!!! This is such a great prize that I just HAVE to enter! posted on my sidebar, I'm a member, and a follower. so exciting! Wow what great blog candy. Thanks for the chance to win. Was not able to sign up to be a follower via blogger so I am following via email. I love the candy!! I am a brand new follower and lovin it!!! Awesome give away! I am a blog follower and member. Wow oh wow, great candy, thanks for the chance to win this package. We posted the candy pic and link at mine and Miss E's blogs. Awesome blog candy! Thank you for the chance to win! I posted both in my side bar and here. Hi Tracey, Cheryl at She Stamps sent me, I am now a follower of the TCC blog. I did post it here: http://linda-creepinalong.blogspot.com/2011/08/crafters-cafe-best-blogning-candy-evah.html. Thanks!!! Hello, my friend Linda (comment above) jumped in after I told her about your candy. Hi I am a new follower and a new member of TCC. I look forward to seeing and learning from your creations. I do not have a blog to post this giveaway on. That's an amazing candy!Thanks for a chance to win! Oh my! What amazing blog candy! I'm a follower and a member of TCC. My e-mail: ayelet dot barkay at gmail dot com. Georgie (http://georgei-butterflygirl.blogspot.com/) just entered your candy and left a message on my blog that she heard about it from me. So glad Cheryl at She Stamps sent me over here! Hi! I'm a new follower! I've posted your blog candy on my blog's left sidebar. Awesome blog candy!!! Found your candy thru Cheryl She Stamps and so glad I saw her post about it!! Thanks for the chance to win! Hi, Kathleen Hernandez (2 comments up) found out about the candy from my blog! Hi again - Sara I - comment above - found out about the blog candy from my blog too. Hi again - Diane (1cardcreator) found out about the candy on my blog. Amazing Candy!!! Thank you so much for the chance! Found out about candy through Cheryl's blog (She Stamps by Cheryl). Wow, great candy. I am a new follower. I have posted it on my blob. Thanks for a change to win. Neat blog. I've become a follower and added to my sidebar. Hi - Лілюська-Lilia saw the candy on my blog. and gave me a shout out above. Hi - callyannc also left a comment she saw on my blog and joined in the fun. Hi, Joanne Gilch (above) also jumped in the fun after seeing the posting on my blog. Hi, I came over from Joanne Gilch (cardologyetc) after seeing the post for this awesome blog candy. Hi there, I am a follower of this blog and a member ot TCC. I will also link your competition to my blog. Hi Tracy, this is absolutely amazing candy. Thanks for the chance ^^ I have posted it on my blog and I am your follower! This is super fantastic candy!! I am a follower and I have posted this on my blog! Thanks for the chance at such great goodies! What an awesome giveaway! I am a follower and member and also posted about this on my blog. Would love to win this!! Wow, what a wonderful Blogcandy. I'm a new follower and member of TCC. Thanks for the chance to win, i've linked you on my sidebar. Thanks for the generous candy and for the chance to win !!!! I'm a new follower! This is some absolutely huge blog candy, I'm drooling! Thanks for a chance to win! Picture is posted, linked and ready to go, fight, win. Thanks for the chance to win! I posted this on my sidebar! WOWZA what phenomenal and generous candy! Anyone would be a fool to pass this chance up. please toss my name in the hat! you are linked up. Great Candy! Love the site too!! Awesome. Great candy. Thanks for the chance to win. Thank you for the great possibility to win such nice candy! Hi from Spain, what a great give away! Thanks for the chance to win. Wow, great giveaway! I am a follower of your blog and a new member of TCC! Thanks for the chance to win! I have posted and linked to my sidebar on my blog about your fantastic giveaway! Thanks! Love the candy! Good Luck everyone! I am a follower of this blog and member of The Crafter,s Cafe Ning group. I'm a new follower here. Thanks for the opportunity to win. Great candy! Thanks for the chance to win! I am a new follower and a new Member. thanks for the chance. I l have posted to my sidebar. I'm a new follower thanks to the Stamping Boutique! I've been searching for inspiration all afternoon and landed at your lovely blog with your even lovlier blog candy. I've posted a pic of it on my blog at: http://paperluvver.blogspot.com/. I am also now a follower, and my e-mail address is rspetersen2009@live.com. I'm so happy to have found you, and thanks for the chance to won your awesome candy!!! Wow! Awesome candy! I saw it on http://evasscrapsncards.blogspot.com and had to come check it out! I'm now a follower, a member, and I posted the link and pic on my blog candy page! Great candy!! Would love to win!! and am a follower of your blog and the forum. Saw this on Eva's Scraps N' Cards. I would love to win. I have been wanting to try copics forever! This is on my blog. I´am new follewer, great candy! Hi, I am Terri of Two Pink Peas and I saw your giveaway on Pendra's blog so I had to hop on over to enter. I am now a follower of your blog. Just a little note, I do NOT follow blogs just to enter in blog candy giveaways. I follow because I like what I see and I will be a frequent visitor of your blog. Thanks so much for the chance to win this AMAZING blog candy. 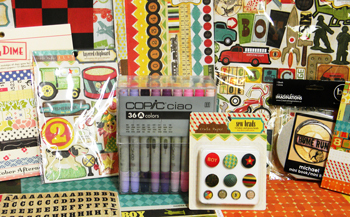 This is really generous of you to offer all of these goodies.. especially the copics.. WOW! I post about your giveaway on my blog on my sidebar too. I am also a new follower of TCC thanks to you. Thanks again for the second chance to win. I really appreciate it and I can't wait to get to know you better. Good luck to everyone who entered!! I'm a new follower to you and TCC. I posted about your give away on my blog :) thanks for the chance to win. I just became a new blog follower and am a member of the TCC. It is exciting. I will go post the giveaway now. Wow!!! What an awesome giveaway! Cathyplus5 told me to come and try for some wonderful blog candy..and since I do everything I am told to do when it comes to blog candy..here I am!! :) Thanks for this opportunity! WOW! What an awesome giveaway. I would LOVE LOVE to win. Thanks for the chance. I have post this on my sidebar. this is such an amazing candy .. i have posted about it in my sidebar ..
i m also a new follower ! Hoping for my chance to win this awesome prize package. Got this posted on my blog as well... would love to win this .... looks like alot of great goodies!!!! This is awesome blog candy! I hope I win! Have an awesome day! wholey sweet tooth! Thats some blog candy!! Im going to post on my side bar right now!! Crossing my fingers im the chosen new follower!!! Amazing candy! Would love to win the copics. Announcing your giveaway on my fb tonight. What an amazing giveaway, i would love to win. Thank you for the chance. Wow! Great give away. I've been wanting to try Copics. What a generous give away!!!! I found you thru Linda!!! I am so happy that I found your blog!! I am just starting to make cards with copics and I am looooving it!!! I will definitely post this to my blog as well Thank you soooo much for the chance to win!! I have this posted on my blog!!! I would love to win this massive amount of scrap happy goodies!!!! The Copics will got great with the new collection I've recently started. Wow! Great give away. . This is so amazing! Copics are a dream for me! I,ve put this news on my blog and follow here and a member of TCC. Wish me luck!!! hi again..just wanted to let you know i am a member of Tcc too. Wow! This is the best candy ever! Sure would love to win! Enchantment Images only One Dollar!! HEY! It's One Buck Wednesday! !